Although we like to think that when we go see a doctor, they will do their best and treat us with the utmost care, there are times when doctors make mistakes that result in serious or even fatal complications. If you believe you have a valid medical malpractice claim, you should first have a basic understanding of the statute of limitations, notice requirements and potential damages you could receive if your claim is successful. The time limits for medical malpractice suits are particularly important to keep in mind given that there are certain prerequisites to filing a claim. Under the relevant Florida statute (Fla. Stat. Ann. § 95.11), a plaintiff must initiate a lawsuit within two years of discovering the injury or when you reasonably should have discovered the injury, or at the latest, four years after the malpractice occurred. This means even if you could not have discovered the injury within the four years, the case may still be barred if you initiate your suit more than four years after the malpractice occurred. One major exception to this general rule is if the health care provider fraudulently concealed the malpractice. For example, a court will find a health care provider fraudulently concealed the malpractice if you can show the provider intentionally deceived you so you did not discover the malpractice. 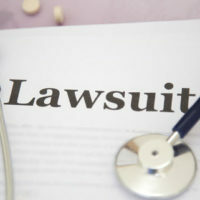 You need to serve the health care provider with a notice of your intent to sue before you can initiate your claim. This notice must include an affidavit written by a medical professional that states you have a valid medical malpractice claim. Once the provider is served, you will undergo a 90-day settlement process that will temporarily toll (halt) the time limit to file your claim. If the health care provider decides during this 90-day period that they do not want to settle, then you can have 60 days or the remainder of the time limit to initiate your claim with the court. Alternatively, you can ask for an “investigation period” wherein you can hire a medical expert to evaluate your case. Florida law provides for different damage caps for medical malpractice claims depending on a wide array of factors. These damage caps apply only to non-economic damages such as pain and suffering and mental anguish. The damage cap varies depending on whether the entity you are suing is classified as a “medical practitioner” (such as a doctor) or a “non-practitioner” (such as a health care corporation). Specifically, Fla. Stat. Ann. § 766.118 provides that for lawsuits against practitioners, there is a $500,000 cap on non-economic damages. For a lawsuit against a non-practitioner, the cap increases to $750,000 for non-economic damages. Hiring an experienced local medical malpractice lawyer can help you understand damage caps depending on your specific case. If you suffered from malpractice in Boca Raton, Stuart, or West Palm Beach, contact the experienced personal injury lawyers at Lesser, Lesser, Landy & Smith, PLLC to discuss your potential options for recovering from the health care provider. Contact us for a free consultation.